From the coppery condenser of the pot in front of me came a bubbling so faint I almost missed it in the buzzing atmosphere. Almost like a pot of steaming coffee brewing, the pirate’s drink came trickling into a jug, clear as the glass that held it and smelling faintly of the molasses that brought it to life. From hungry yeast feasting on fermentable sugars in Caribbean cane to this final, quiet, unassuming moment, we witnessed the creation of rum as it had been done for generations. I congratulated my distiller friend, who had invited me across San Francisco one evening to watch the birth of his newest creation and sample its full-bodied character. I relished hearing the history of this spirit from someone who actively participates in its full lifespan—from creation to transformation in a lowball glass. Though I sip my rum neat (especially if it comes to me straight from the oak barrel), I’ve learned to appreciate the subtle art of a perfectly balanced rum cocktail—particularly one that beautifully complements the flavors of South Indian cuisine. Whether it goes by Barbados Water, Rumbullion, or Kill-Devil, rum has plenty of well-deserving nicknames distilled from its fascinating history. In the 17th century, plantation slaves first discovered that the bittersweet byproduct of sugar could be fermented into the world’s most popular Caribbean export to date. It’s no surprise that sugar cane made far more gold than El Dorado ever held. After the Royal Navy captured Jamaica, grog spread wherever the Union Jack flew. Privateers and pirates like Captain Flint valued rum more than any other booty—perhaps because a tot of rum with a splash of lime juice (the real active ingredient) kept scurvy at bay. While Caribbean rum holds a special place in my heart, the West Indies weren’t quite the birthplace of this sweet spirit. Sugar cane made its way to the Caribbean from its original home of Papua New Guinea, and fermented sugarcane juice goes as far back as ancient India. Marco Polo even mentions encountering the drink during his travels. Ushered in by these ancient precursors, rum took hold in the colonies and became the most valuable spirit within the British Empire. From Australia’s Rum Rebellion to Prohibition-era rum runners in the USA and Old Monk and McDowell’s in India, this spirit made an impact all over the globe. Before Old Monk became the standby liquor for Indians—from the man on the street to the nearby officer—Hercules rum was distilled primarily for the armed forces. Old Monk rum soon surpassed its ancestor in quality and became the primary IMFL brand for decades. With the celebration of Melanesian culture, Don the Beachcomber’s stylized tiki atmosphere brought tropical rum drinks to California. The Voice himself enjoyed Rhum Rhapsodies alongside other 1940s stars, and the trend spread from Hollywood all the way to NorCal. From Trader Vic’s of 1937 to Smuggler’s Cove and Tonga Room of 2017, San Francisco has given the tiki trend its own unique Bay Area twist. Gosling’s Black Seal: A well-balanced and rich flavor profile awaits when you crack the wax seal on these Bermuda bottles. Originally produced by the James Gosling family in 1806, this is a perfectly curated product of the longest surviving Bermuda business. Agnostura: This aged spirit comes straight from Trinidad, where warm sunshine from the Windward Islands makes its way into your cocktail. This company may be most famous for its bitters, but we think their rums make the best Hot Toddies. El Dorado Aged Rum: Our richest pick for a young spirit, this rum distills the humidity of Guyana into oak barrels of liquid gold. When an 8-year-old bottle has the maturity of a 16, you know you’ve happened upon something special. DOSA’s Ginger Ante is an Indian take on the Dark and Stormy, featuring Gosling’sBlack Seal. Our favorite spicy rum is enhanced by the addition of house-made ginger-jaggery nectar and Blenheim’s spicy ginger ale, served tall with a rosemary swig. If you’re looking for a nightcap to warm your spirits, you’ll want to try our Port of Call—DOSA’s unique spin on a Hot Toddy. Angostura aged rum shines alongside Singani 63 (Steven Soderbergh’s unaged bolivian eau de vie) and St. Elizabeth Allspice dram. The addition of house-made spiced honey and hot water makes for a comforting cocktail served with star anise. For a bright taste, savor the Faux Swizzel, an Indian take on the real McCoy. El Dorado aged rum is served over crushed ice with St. Germaine and Chicory bitters. For a sweet final touch, lead bartender Chris Lukens garnishes this swizzel with a sugar dusted mint sprig. When Caribbean sweetness meets South Indian spice, we experience a marriage of two complementary equals. Distilling, serving, and enjoying this classic spirit puts you right in the middle of a centuries-old interplay between the old world and the new. And whether you’re enjoying your rum from a $40,000 bottle of Wray and Nephew or sipping sours from a conch shell in Barbados, rum will take you around the globe with its colorful history and timeless flavor. 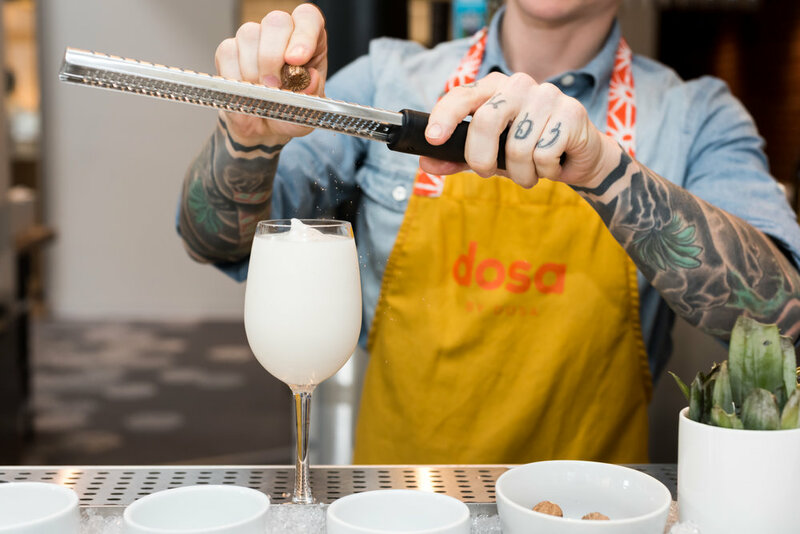 DOSA’s rum cocktails transport you from the West Indies to the East Indies and back again—straight from San Francisco. Reserve your table to get in on the mix.